For July, Rick Stadelmaier of Equinox Audio (refer to http://www.equinoxaudio.com.au) visited to present a system based on his latest Equinox Audio speaker. Rick last presented to the Sydney Audio Club in October 2010. Since then, much has changed in the Equinox Audio line – drivers, cross-overs, etc. So we thought it was time for a revisit. Of course Rick was accompanied by his wife Trish. Together they make hand crafted high end speakers here in Australia using the highest quality parts available. Their home and factory is north of Windsor in the Lower Portland area. Equinox Satellite – Refer to http://www.equinoxaudio.com.au/speakers/satellite.html. The Equinox Satellite speakers have a range of 70Hz-30kHz +/-2.5dB @ 3.5M. Although they are on the small side, they can handle fairly high SPLs with low distortion. The first thing I noticed visually was the improved finish on the cabinets – these latest speakers had a more professionally applied veneer than the Neptune floorstanders that Rick had presented in 2010. 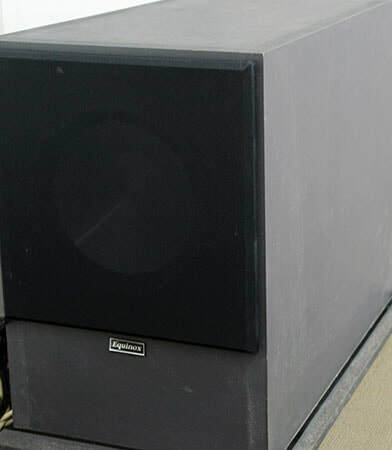 Equinox Equator 1 Subwoofer – Refer to http://www.equinoxaudio.com.au/subs/e1.html. This provided a range of 18 Hz to 200 kHz +/-2.5dB @ 3.5M. It has a 300mm driver, and has an inbuilt 500w amp. It also has high power handling. This sub is large and heavy – its size was reminiscent of the old Master Reference subs built by Krell in the D’Agostino era of Krell. It didn’t have quite the articulation of the old Master Reference sub but at a fraction of the cost, it sounded very good. Equinox 200wpc MOSFET power amp – utilizes dual 500va transformers. This amp is basically a REDGUM Audio amplifier that has been built to Rick’s specifications. Refer to http://www.redgumaudio.com/au/rg_frame.html. Primare PRE30 pre-amp – Refer to http://www.primare.net/product.asp?ProductID=53. The PRE30 is an upgradable audiophile pre-amplifier designed to match the Primare A34.2 and all Primare power amplifiers. It features a comprehensive OLED display and control parameters. It’s housed in a heavy gauge alloy steel chassis, and has two pairs of low-noise balanced XLR inputs and 4 pairs of RCA inputs. In addition there are two pairs of RCA outputs and a single pair of balanced XLR outputs. 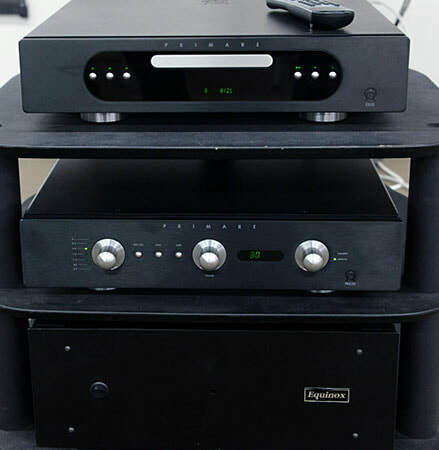 Primare CD31 CD player – This player is now superseded, but is still a very reputable player. It is now replaced with the CD32. Refer to http://www.primare.net/product.asp?ProductID=49. After the initial introductions, Rick gave us some background about Equinox Audio. It is run solely by Rick and Trish – between them, they do everything – design and analysis, source components, source supplies like MDF and veneer, do the cutting, gluing, applying the veneer … everything! Rick then spoke briefly about each piece of gear, with an emphasis on the speakers of course! After about a 10 minute presentation, Rick presented some tracks that he thought would be appropriate for the system. For Rick’s presentation, he left the sub in stand-by. He wanted us to hear what his new Satellite speakers could do on their own merit. It was surprizing that they filled the room as well as they did. In fact, someone along the way asked if the sub was on. After Rick’s presentation, we played the same track twice – once with the sub off and again with the sub on. Most people preferred the sound with the sub on so we left it on for the balance of the meeting. Stephen Chen was our presenter in our member’s music segment this month. Stephen had selected a good variety of tracks for us. And the chatter on our Facebook group afterwards indicated it was well received. (btw - if you wish to join our Facebook group then please speak with anyone on the Committee and we’ll see that it happens). And how did it all sound? Of course, small speakers don’t usually have the same dynamic ability or volume handling as large speakers (you can’t cheat the laws of physics). They often sound better with small-scale music than large-scale music, but that can be somewhat mitigated by an appropriately sized small room. Of course, our room at Epping isn’t small! So as was anticipated, they did have a soundstage that was somewhat small and less expansive sounding. The sound didn’t seem to extend much beyond the outside of the speakers. 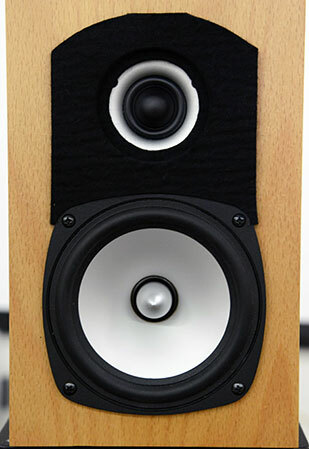 And of course, small speakers often don’t handle high levels to get the sound out into the room. But these diminutive Satellite speakers fared very well in that respect. However, to my ears I did hear a somewhat boxy sound at times, in the manner a voice changes when heard through a large pipe. This is usually much less noticeable in small speakers compared to large speakers with huge expansive side panels. So I was surprised, but with time I realized what I was hearing was dependent on volume and source material. This aberration was somehow linked more to higher volumes and perhaps less than optimal recording/mastering quality. And I believe it was less noticeable when the sub was turned on, likely because the sub helped give body to the mid-range as well as the lower bass. I think in an appropriately sized room the little Satellite speakers would sound very good indeed. No one commented on their feedback form about harshness or brightness. I dare say that’s the first time in recent memory! A few people did comment very favourably on the balance between the main speakers and the sub, and the balance of the overall system including the electronics. Regarding the music, the electronica track by artist Adam Michalak received the most comments – mostly good, but a couple of people didn’t like it. Other tracks that garnered many favourable comments were Basso Profundo (Russian choir), the Hilliard Ensemble and Chris Jones (Roadhouses and Automobiles).